One of the finest specimen of Mughals period is the Aurangabad Fort, commonly known as Lalbagh Fort, which indeed represents the unfulfilled dream of a Mughal Prince. It occupies the south-western part of the old city, overlooking the Buriganga on whose northern bank it stands as a silent sentinel of the old city. Rectangular in plan, it encloses an area of 1082' by 800' and in addition to corners and a subsidiary small unpretentious gateway on north, it also contains within its fortified. Perimeter a number of splendid monuments, surrounded by attractive garden. These are, a small 3-domed mosque, the mausoleum of Bibi Pari, the reputed daughter of Nawab Shaista Khan and the Hammam and Audience Hall of the Governor. The main purpose of this fort, was to provide a defensive enclosure of the palatial edifices of the interior and as such was a type of palace-fortress rather than a seize-fort. Ahsan Manzil situated at Kumartoli of Dhaka on the bank of the Buriganga, was the residential palace and the kachari of the Nawabs of Dhaka. It has been turned into a museum recently. The construction of the palace was begun in 1859 and completed in 1872. Abdul Ghani named it Ahsan Manzil after his son Khwaja Ahsanullah. At that time the newly built palace was known as Rang Mahal and the earlier one was called Andar Mahal. 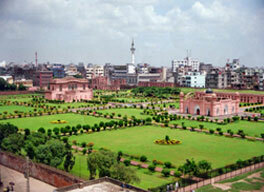 Ahsan Manzil is one of the significant architectural monuments of the country. Established on a raised platform of 1 metre, the two-storied palace measures 125.4m by 28.75m. The height of the ground floor is 5 metres and that of the first floor 5.8 metres. The capital city of Sonargaon, obviously of Hindu origin, was situated on the northern bank of the Dhaleswari, close to the confluence of the Dhaleswari and the Sitalakshya, and also close to that of Old Brahmaputra and the Meghna. The site of the city is lying about 27 kilometers almost southeast of Dhaka city. The area now known as Panam in Sonargaon, about 2.5 kilometers to the north of the Dhaka-Chittagong highway at Mograpara point. 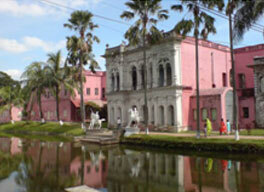 Bangladesh Folk-Art Museum is situated at Sonargaon. It is open for the tourists from Friday to Wednesday from Morning 10-00 am to afternoon 5-00 pm. The Sixty Dome Mosque (more commonly known as Shait Gambuj Mosque or Saith Gunbad Masjid),a UNESCO World Heritage Site, is a mosque in Bangladesh, the largest in that country from the Sultanate period. It has been described as "the most impressive Muslim monuments in the whole of the Indian subcontinent. 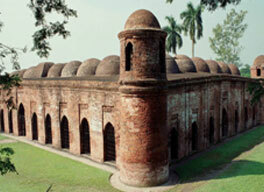 The mosque is locally known as the 'Shat Gombuj Masjid', which in Bangla means Sixty Domed Mosque. However, there are 77 domes over the main hall and exactly 60 stone pillars. It is possible that the mosque was originally referred to as the Sixty Pillared Mosque where Amud meaning column in Arabic/Persian, later got corrupted to Gombuj in Bangla, which means domes. Mainamati is only 114 km. from Dhaka city and is just two hours drive on way to Chittagong. Paharpur, Badalgachhi Upazila, Naogaon District, Bangladesh (25°1'51.83"N, 88°58'37.15"E) is among the best known Buddhist viharas in the Indian Subcontinent and is one of the most important archaeological sites in the country. It was designated a UNESCO World Heritage Site in 1985. 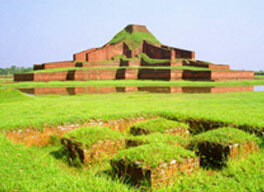 Mahasthangarh is one of the earliest urban archaeological sites so far discovered in Bangladesh. 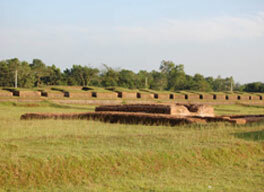 The village Mahasthan in Shibganj thana of Bogra District contains the remains of an ancient city which was called Pundranagara or Paundravardhanapura in the territory of Pundravardhana. A limestone slab bearing six lines in Prakrit in Brahmi script, discovered in 1931, dates Mahasthangarh to at least the 3rd century BC. The fortified area was in use till the 18th century AD. 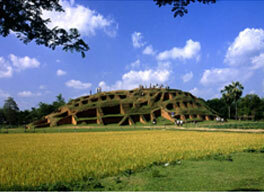 Mahasthangarh is a notable historical tourist attraction of Bangladesh. Many tourists come here to see the glory of Mahasthangarh. Patenga is a popular tourist spot. The beach is very close to the Bangladesh Naval Academy of the Bangladesh Navy and Shah Amanat International Airport. Its width is narrow and swimming in the seas is not recommended. Part of the seashore is built-up with concrete walls, and large blocks of stones have been laid to prevent erosion. During the 1990s, a host of restaurants and kiosks sprouted out around the beach area. Lighting of the area has enhanced the security aspect of visiting at night. Cox's Bazar is a seaside town, a fishing port and district headquarters in Bangladesh. It is known for its wide and long sandy beach, which is considered by many as the world's longest natural sandy sea beach. 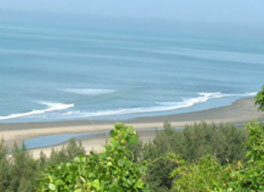 The beach in Cox's Bazar is an unbroken 120 kilometres (75 mi) sandy sea beach with a gentle slope. 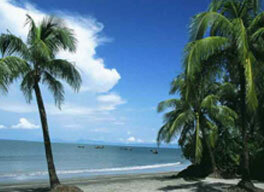 It is located 152 kilometres (94 mi) south of the industrial port of Chittagong. 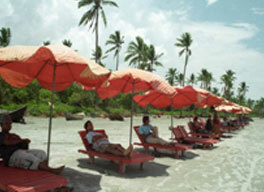 Today, Cox's Bazar is one of the most-visited tourist destinations in Bangladesh. It has yet to become a major international tourist destination, and has no international hotel chains because of the lack of publicity and transportation. Teknaf Peninsula is one of the longest sandy beach ecosystems (80 km) in the world. It represents a transitional ground for the fauna of the Indo-Himalayan and Indo-Malayan ecological sub-regions. Important habitats at the site include mangrove, mudflats, beaches and sand dunes, canals and lagoons and marine habitat. Mangrove forest occurs in Teknaf peninsula both as natural forest with planted stands and mostly distributed in the intertidal zone. The Teknaf peninsula mangroves supports the habitat of 161 different fisheries species (Chowdhury et al., 2011). Teknaf reserved forest is one of the oldest reserved forests in Bangladesh. 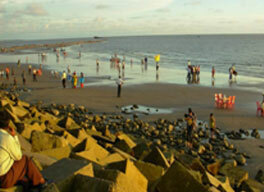 Kuakata is a panoramic sea beach on the southernmost tip of Bangladesh. Located in the Patuakhali district, Kuakata has a wide sandy beach from where one can see both the sunrise and sunset. 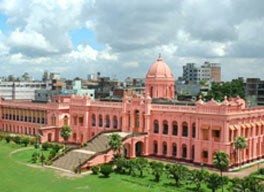 It is about 320 Kilometers south of Dhaka, the capital, and about 70 Kilometers from the district headquarters. 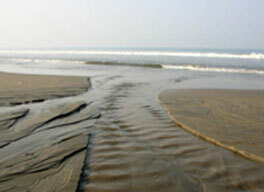 The Kuakata beach is 30 km long and 6 km wide. St. Martin's Island is a small island (area only 8 km2) in the northeastern part of the Bay of Bengal, about 9 km south of the tip of the Cox's Bazar-Teknaf peninsula, and forming the southernmost part of Bangladesh. There is a small adjoining island that is separated at high tide, called Chhera island. It is about 8 km west of the northwest coast of Myanmar, at the mouth of the Naf River. It is possible to walk around the island in a day because it measures only 8 km2 (3 sq. mile), shrinking to about 5 km2 (2 sq. mi) during high tide. The island exists only because of its coral base, so removal of that coral risks erosion of the beaches. Because of this, St. Martin's has lost roughly 25% of its coral reef in the past seven years.